Accommodates 2 bi-fold doors up to 18 inch wide 3/4 inch to 1-3/4 inch thick & up to 40 lb per panel, lifetime warranty. No track. 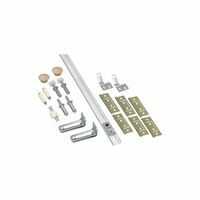 Set includes: Shock absorbing hinges, top & bottom pivots, top guide, 4-way adjustable jamb bracket which corrects warped doors & allows installation without cutting carpet, door aligner, stops, knobs & wrench. For doors up to 18" x 96" x 1-3/4", weighing 40 pounds. 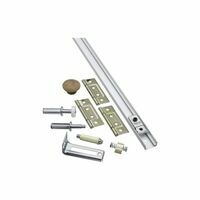 Automatic top of door spacing eliminates gaps. Steel track with positive pivot lock. Surface mounted pivots and guides (no hole drilling). Four way adjustable bottom pivot bracket and shock absorbing hinges. 14-16 gauge zinc dichromate plated steel parts. Includes all hardware to make 2 or 4 door panels fold. Tracks can be cut to fit smaller door/opening widths. 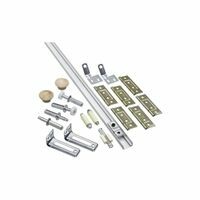 Set Content: (1) 1700 track length, (2) 1701 top pivot lock, (2) 1701 top pivot, (2) 1705 door guide, (2) 1713 track stop, (6) 1703 hinges, (2) 1706 bottom pivot, (2) 1711 pivot bracket, (1) 1808 door aligner, (2) 33 door knob, and (1) 1712 wrench. For doors 12-18" wide, 1-3/4" thick, weighing up to 30 pounds each. 14-16 gauge zinc dichromate plated steel parts. Control arms can be adjusted accommodate non-standard door panel widths. Set includes (1) 1601 control arm, (3) 1605 hinges, (3) - 1703 hinges, (1) 1513 door stop, (.5) 1808 door aligner, and (1) 33 door knob.